The Case-Shiller Index for September was released today. Note that it will mostly reflect sales negotiated in August or before, during the slower summer sales season. (The next Index, published in late December, will begin to reflect transactions negotiated in September and the start of the autumn sales season.) 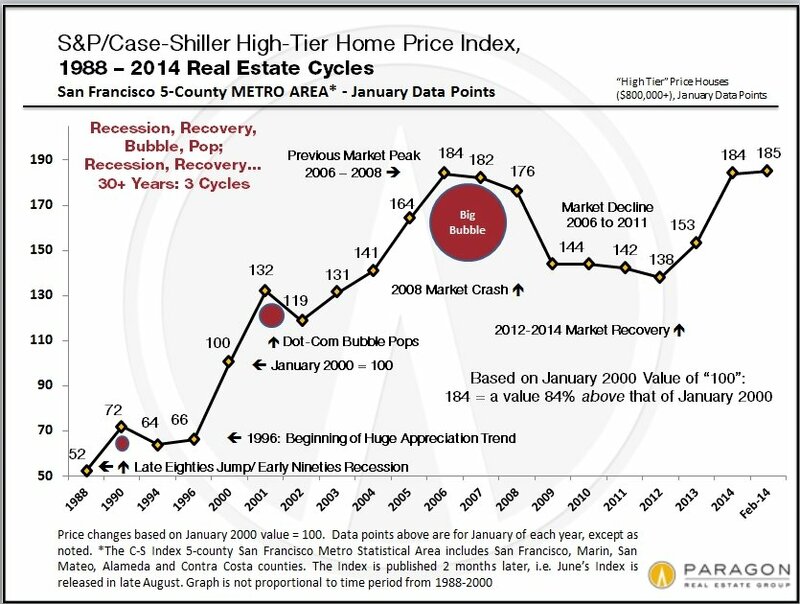 These 2 charts pertain to the upper third of sales for 5 Bay Area counties – upper third by price range. 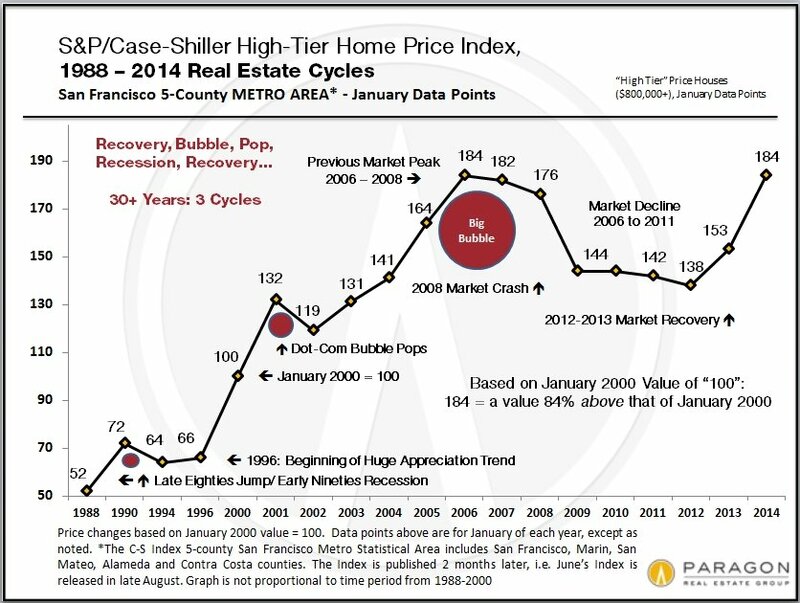 The majority of home sales in San Francisco, Marin and San Mateo are in this upper price tier. As noted in recent Paragon reports, after the feverish market and home price appreciation of spring 2014, home values in the higher-end neighborhoods typically flattened or ticked down a bit, while more affordable homes generally continued to tick up in price. Short-term fluctuations are not particularly meaningful until confirmed over the longer term, since markets fluctuate for a variety of reasons including seasonality. For the past 3 years, home prices have surged in the spring and then plateaued during the summer. It is too early to speculate whether home prices are trending down a bit after the spring market frenzy, which is certainly possible. For any definitive sense of home price trends, we will have to wait until the autumn-selling season numbers are in. Autumn this year began with a big surge in the number of new listings in September. 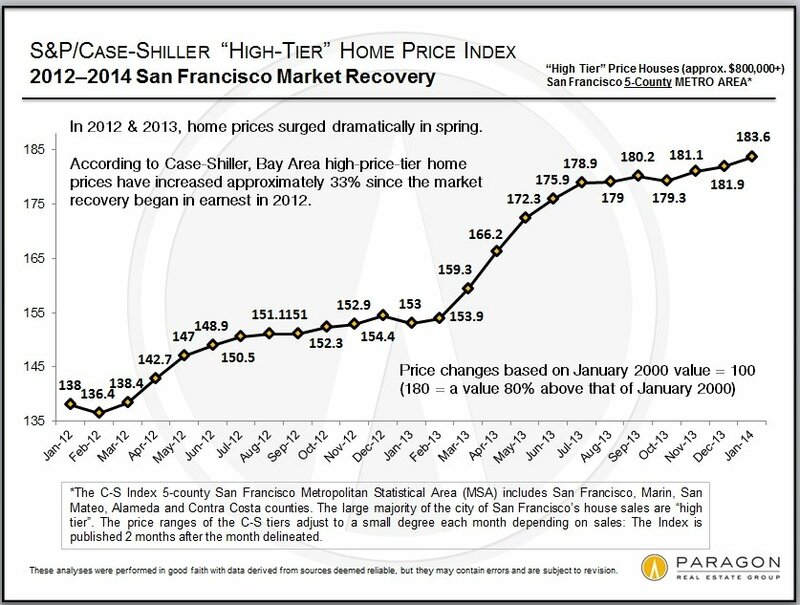 Remember that the C-S Index covers not just San Francisco, but 4 other Bay Area counties and is a 3-month rolling average. 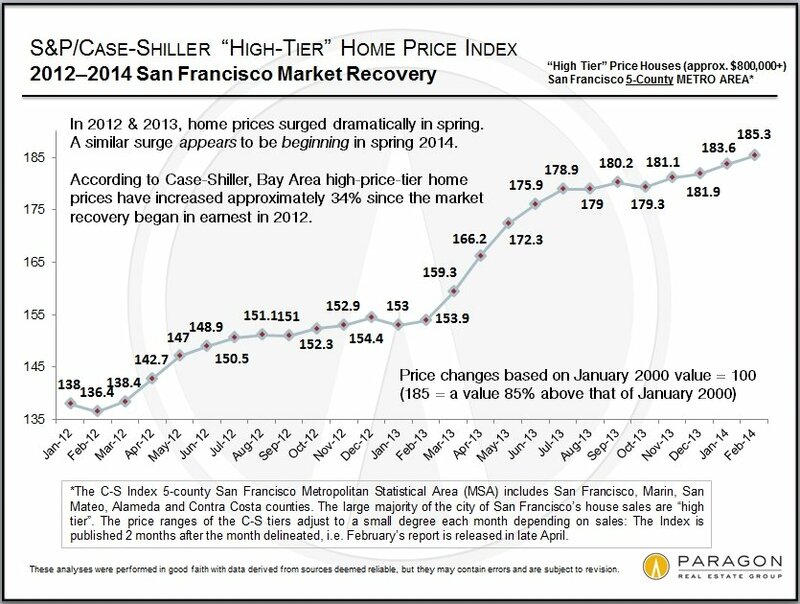 San Francisco makes up a very small part of all the house sales being surveyed by the Index and C-S home prices reflect offers negotiated in previous months – thus the June 2014 peak reflects the heat of the market in the heart of the spring 2014 selling season. The small dip in July 2014 from the spring peak can be seen. Small fluctuations up and down are not particularly meaningful until substantiated by longer term data. Since the recovery began in earnest in early 2012.